The competition prevailing in the global biochemical sensor market is considerably high. As leading companies fight out for the lead in the market, product innovations and launches are on cards. Besides this, investments in research and development have scaled higher as market players aim for emerging at the fore. In order to boost operations, several players are concentrating on expanding their regional footprint, especially in Asia Pacific. Cheap labor, abundance of raw materials, and the rising demand from emerging nations make the region highly lucrative for investment, finds Transparency Market Research (TMR) in a new study. Some of the most prominent names in the global biochemical sensor market are GE Healthcare, Thermo Fisher Scientific, Honeywell International, Inc., Bio-Rad Laboratories, Inc., and Polestar Technologies, Inc., among others. Besides aforementioned strategies, many of the market players are also pushing mergers and acquisitions to capitalize on their expertise and expand their product portfolio. Overall, the global biochemical sensor market will rise at a robust CAGR of 14.7% between 2017 and 2025. At this pace, the market is expected to reach US$58.48 bn by the end of 2025, from its valuation of US$17.1 bn in 2016. Based on product, electrochemical sensors constituted the leading segment with a share of 32% in 2016. Besides this, piezoelectric sensor, thermal sensor, gas sensor, and optical sensor make other key segments in terms of product. Regionally, North America held dominant with a share of over 29% in the global market in 2016. Europe and Asia Pacific followed closely as the second- and third-leading markets for biochemical in the same year. However, over the course of the forecast period, North America is likely to lose its market share, while Asia Pacific and Europe markets will witness accelerated pace of gains. As biochemical sensors have found a leading end user in the healthcare sector, growth witnessed in the industry will subsequently fuel their demand. The healthcare infrastructure is a major consideration by governments when planning economic growth. Over the years, the industry has expanded exponentially. Additionally, investments in research and development are forecast to increase in the coming years. “Biochemical sensors are used in the qualitative and quantitative assessment of clinical diagnosis in the healthcare sector,” said a lead TMR analyst. “The increasing aging population, coupled with the rising incidence of chronic ailments, will fuel the demand for precise diagnosis, thus providing significant impetus to the biochemical sensor market,” he added. Besides this, government initiatives to ensure superior food quality, advancements in material chemistry and wireless networks, the rising demand for advanced wearable biochemical sensors, and the growing population of point of care diagnostics will create lucrative market opportunities. TMR also prophesized that the rising oil extraction worldwide will tip scales in favor of the market. Rise in oil extraction would result in greater percentage of inflammable and toxic in the air. Spurred by this, the use of biochemical sensors will increase to detect the presence of toxic gas. 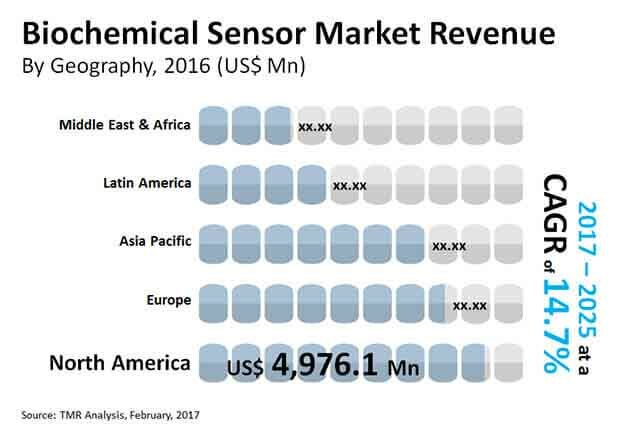 On the downside, high cost of biochemical sensors will hinder the sales to an extent. In addition, complex product design and incompatibility with real-world application portend hard-time for the market. Nevertheless, advancements in the wireless technology will help reduce the impact of aforementioned bottlenecks. The market will also gain from the rapid proliferation of wearable technology.